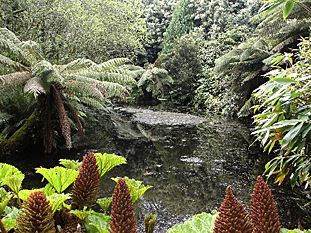 Penjerrick is a beautiful 200 year old 15-acre spring-flowering sub-tropical woodland garden with fine views of the sea. Rhododendrons, camellias, magnolias, azaleas, tree ferns and bamboos. Home of the Penjerrick and Barclayi hybrid rhododendrons. Luxuriant valley garden can be reached by a wooden bridge. 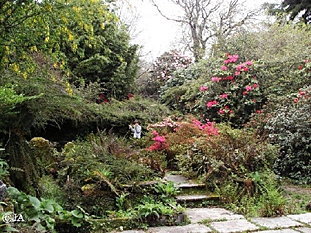 Penjerrick Garden is situated about three miles south-west of Falmouth. 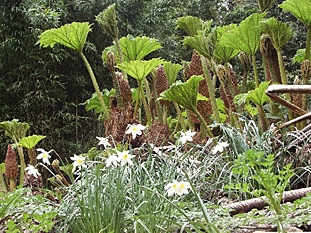 Coming from the A39, initially follow the signs for Trebah and Glendurgan Gardens and, after three miles off the A39, you cannot not miss the signs for Penjerrick. Please feel free to park on the grass verge along the drive.